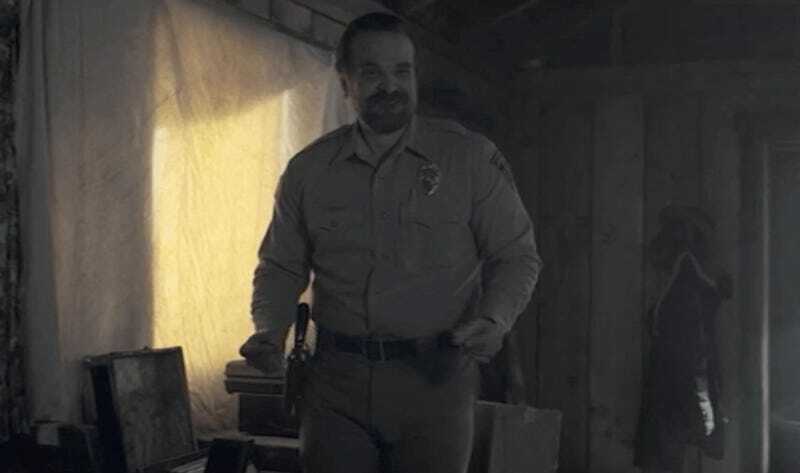 If you look up “Dad Bod” in the Merriam-Webster dictionary, or at least on its Twitter account, you’ll see Stranger Things’ Sheriff Jim Hopper in all his dancing glory. But actor David Harbour’s lovable little paunch has since made way for a Hellboy six-pack, leaving us wondering if the next season of Stranger Things will include Hopper hitting the gym and asking the boys, “Do you even lift?” Happily, Harbour has promised the paunch will return. In an interview with Variety, Harbour shared that he’s done filming the new Hellboy film, for which he spent months with a trainer working on reshaping his body. While some of the muscles look to be thanks to the wonder of special effects, Harbour did clearly shed some pounds and put on some muscle for the part. Since he’s completed filming, there were questions about whether his reshaped physique would come into play next season. Would Sheriff Hopper be hitting the gym, like the shirtless sheriff in Riverdale? No, it looks like Harbour is eager to get Hopper’s original body back. “I’ve already started the donut training. Six donuts a day! We’ll get there, folks,” Harbour said. Harbour also chatted about the now-famous Dad Dance™ from Stranger Things 2, where he danced to “You Don’t Mess With Jim” by Jim Croce. He commented how, while it’s far more common for women to experience judgment based on their physical appearance, it does also happen to men like him, and he said seeing his normal body being celebrated was “gratifying.” He also shared some insight about that dance, which was apparently an ad-libbed moment he assumed would be left on the cutting room floor. [Director Shawn Levy] and I have different memories of this. I chose the song, and I remember him saying put on the music. But I said, “Shawn, I want to dance. I know it’s going to be weird, but I want to do it.” I think one of the reasons why it works is because Hopper is such a serious, sensitive, dark dude. He’s not normally a dancer. That’s what I found compelling about it. So on the day it was us playing around. They said, “We don’t even know if we’ll use it, we’ll probably cut away.” And then when they were in the editing room, it became this thing. Stranger Thing has been confirmed for a third season, but likely won’t return until 2019.